Ho-Pin Tung (R) Dragon Racing Crashed during qualifying attempt on Pole Day, not medically cleared to continue taking part in qualifying. Raphael Matos AFS Racing Bumped from the field, too slow to re-qualify. James Jakes (R) Dale Coyne Racing Bumped from the field, too slow to re-qualify. 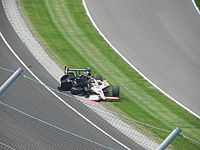 Mike Conway Andretti Autosport Bumped from the field, too slow to re-qualify. Ryan Hunter-Reay Andretti Autosport Bumped from the field – replaced Bruno Junqueira in the #41. Sebastián Saavedra Conquest Racing Bumped from the field, too slow to re-qualify.